Ultra-modern, tempered-glass surface whiteboard delivers high-quality performance. Durable and magnetic, it doubles as both a smooth writing surface and a display platform. Either write or hang notes to keep yourself organized. This frameless board is a good fit for any contemporary office. Occasional cleaning is recommended for best performance. Works best with Quartet Neon Dry Erase Markers (sold separately). 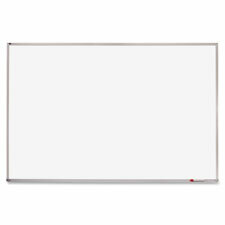 Board Type: Magnetic Dry Erase; Board Width: 72"; Board Height: 48"; Surface Material: Glass.